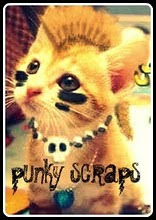 Since last week Punky scraps is back on track, yaaay!! Here's my take on the lovely sketch/picture for inspiration. I took the photo with my iPhone, and the frame was made with another app... Just love my iPhone! 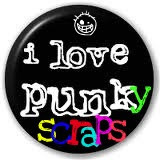 :-) The buttons came from different sweaters I threw away the other day, of course I saved them first!! Läcker layout! Snyggt med ringarna och de andra mönstrena du har skapat.